This DVD/CD combination is a must for the equine veterinarian to learn how to perform diagnostic nerve blocks in the horse. 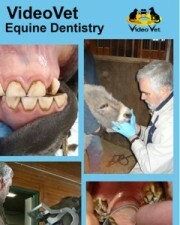 The general approach to local anesthesia in the horse is described in the CD and demonstrations of every perineural block of both the forelimb and hind limb are included in the DVD. These include the palmar digital block, the basi-sesamoid block, the pastern ring block, the low palmar or 4-point block, the high palmar block, the lateral palmar block (medial and lateral approaches), the ulnar block, the median and medial cutaneous antebrachial block, the low 6-point block in the hind limb, the high plantar or subtarsal block, the deep branch of the lateral plantar nerve block, and the tibial and peroneal nerve block. Anesthetic volume, needle size, and limb positioning for each block are included in the text and illustrated on a live horse.